Sony PlayStation Now is a brand new online gaming service that enables you to stream games to your Sony PS4, PS3, PS Vita or selected Sony Bravia TV. Due to launch in the US in Summer (2014) with Beta testing starting in January, the service means that PS4 owners will be able to stream older games from the cloud - helping to solve the problem of backwards compatibility. The service hasn't yet been given a UK release date - which countries end up getting the service is likely to depend on their broadband infrastructure. Final US packages and pricing have yet to be announced but we were told that they'll likely be two packages - one rental and one subscription. As well as streaming to various Sony products, you'll also be able to move your gameplay across devices, so if you start playing a game on your PS3 you can log off then carry on where you left off on your PS Vita or TV - the same concept as switching between deivces when you're watching something on Netflix. The service should also be able to stream to smartphones like the Sony Xperia Z1 and tablets like the Sony Xperia Tablet Z.
Sony was demoing the service with just four games at CES - The Last of Us, Beyond: Two Souls, The Puppeteer and God of War: Ascension. There was no word on which other titles would be available or how many games there will be at launch. We played on a PS Vita with God of War Ascension being streamed from the cloud. The gameplay was instant and we couldn't see any degradation in graphics quality on the small screen. 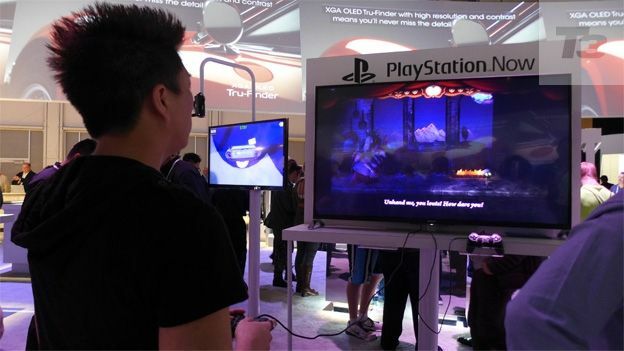 Playing The Puppeteer on a Sony Bravia TV, there was also no noticeable lag - it was just like playing directly from a PS3. There was no obvious drop in video quality either on that particular game. Sony PS Now is excellent news for PS4 owners who still want to be able to play their old PS3 games. The ability to chop and change between devices is also very compelling. We certainly hope that our broadband is up to the challenge in the UK as we want to get stuck into the service asap. We'll keep you posted as and when we get any more info.